You are here: Home / News / The Power of the African-American Family. The Power of the African-American Family. 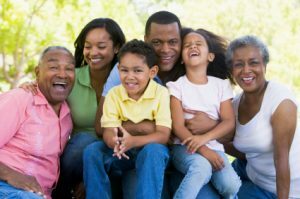 (ThyBlackMan.com) The unified, united African-American family with clearly defined roles and a strong sense of self worth and identity is the true power and victory for every single member of that family. It is the foundational core of our communities, the church and the Mosque. It is the launching pad for stability, security, careers, identity, financial, spiritual and sociological success. It is the blueprint for all successful relationships, whether business, personal, political or spiritual. It is the essence of our values, morals, principles and character. It is also taken for granted and often forgotten. So let this article take you deep deep into the substance and power of the real African-American family. Today the power within, the unity of and the focus on the African-American family has been lost. Lost from yesteryear and replaced with destructive cycles created by others to neutralize and erase who you are. Many of you have never known that power and others of you have forgotten it. There are far too many broken and dysfunctional homes amongst our people and even more excuses backed by immaturity and problems that could have been resolved. Yes there is racism, police brutality, an unfair justice system, voter suppression and racial oppression. But how much of it do we allow and contribute to with black on black crime, willful ignorance, denial, excuses and complacency? And why? How much of it could be stopped at the door and shut down when it came face to face with strong African-American families? Most of it. If the power is in your hands, your spirit, your belief, your heart, your prayers and your actions, think about how much more that power is multiplied and amplified when our families come together. Think about that and wake up. Young African-American children are taking their identity from where ever they can find it – no matter how warped, twisted and perverted their examples and role models are. From Kanye Lost to Kim KarTrashian to Nikki Mirage to guys who bounce a ball, throw a ball or pick up a mike, these “performers” have sadly become the role models for our children. Even jailed comedians who can’t keep their pants closed and talk show hosts with no sense of family, self or God have taken center stage for too long as those we look up to. But we can do much better than that and the best examples are often sitting right in our own households. If only you and those around you would wake up and really the greatness within. OUR YOUNG PEOPLE NEITHER TRY TO REPRODUCE NOR REBUILD THE AFRICAN-AMERICAN FAMILY BECAUSE THEY DO NOT BELIEVE THAT IT EXISTS! Our men call themselves boys, hustlers, players and ballers but act like little boys and dogs. Our women call themselves divas and queens. All the while they are confused and masquerading as something they are not – or rather something they should never be. All the while calling themselves anything but men and women of excellence, purpose, identity and stature. All the while seeking approval for what they appear to be when in reality they are not. Never coming to the knowledge of self, the awareness of greatness, the expectation of excellence. Always pretending to make themselves feel better about what they are not instead of becoming who they were born to be. The family has everything to do with this because the value, strength and identity of the family transfer to every single one of its members – or at least it was intended to. but the lack of all of the above transfer over as well – as weakness not strength, as confusion not clarity of purpose, as instability instead of sound foundations. When is the last time your immediate family sat down together and just talked? No phones, tablets or games systems. Just talk. When is the last time you ate dinner as a family other than a holiday or after a funeral? When is the last time your family went to a movie together or even watched one at home? Or even played a board game and laughed together? Have we gotten too busy, have we forgotten what family means or did many of us ever know? Children in the African-American community and bombarded with technology, perversion and all sorts of combinations of the two. They are more confused than ever about who they are, why they are and who or what they should desire. Their attention spans grow shorter and shorter while education competes with weed, bling, style and the latest video game or pair of Nike shoes. Absentee and drop-out rates are far too high. Discipline problems are rampant. Test scores are failing. Graduation rates are low, no matter how you twist the stats. Teen pregnancy and prostitution are at alarming rates and everybody wants to get “high’ on marijuana mixed with everything from rat poison to embalming fluid to feces. All to escape reality. Largely in part because the family unit is malfunctioning. There is a reason your grandmother, her siblings and parents sat down and ate together. There is a reason they checked homework and read bedtime stories. There is a reason they went to church together. There is a reason they stayed in touch with each other, never got too busy and never moved too far away. There is a reason back then they seldom took each other for granted. They understood the value of time and the meaning of family. But do you understand why? The African-American community can no longer blame the schools, the police, the president, the courts, the system, the “white” man and racism for the decline of our families if we have become part of the problem yet choose to do nothing about it. Charity starts at home so before we try to “do our own thing” or before we make excuses that we are “too busy”, the family needs to become our priority once again. We see this and the impact of this realization put into practice within cultures and ethnic groups throughout the world. But we have become doers, not just observers. Wake up people. Focus, purpose, teaching our children, being real parents and positive role models and taking care of our elderly has to be our priority. And great expectations of ourselves based on identity, keeping our word, setting goals and following through will bring us much closer to where we need to be. But we must stop taking the power and unity of the family for granted. It’s past time that you knew and you can only be part of the solution or you are automatically part of the problem.